If your looking for a community with lime stone entrances, fountains, soft green fences and a feel for a quiet Texas hill country destination, then you have found Riata Ranch. 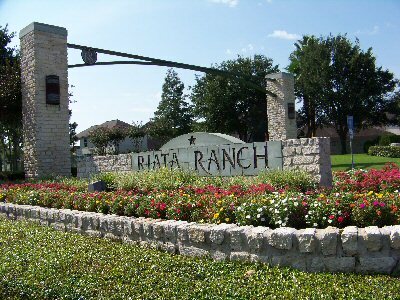 Riata Ranch was one of the first communities developed in northwest Harris county during the mid 1990s. Just south of Highway 290 along Barker Cypress, Riata Ranch is strategically positioned between Highway 99, the Grand Parkway, and the Sam Houston Toll Roads. Riata Ranch homes for sale in 2015 recorded sales between $150,000 to $335,000. Most of the homes are 2,000 to 3,000 sqft and were built between 1996 and 2003. Several of the 1,026 homes finished in Riata Ranch back to the Houston National Golf Club and are located in gated sections. In the center of Riata Ranch, a large multipurpose park sits for all to enjoy. Athletic fields, Jr. Olympic Pool, club house, tennis courts, miles of trails and my personal favorite, a children’s motorized figure 8 track including traffic signs and a small bridge. Mature trees here and throughout the community. Rennell Elementary, Spillane Middle and Cypress Woods High school in the Cypress-Fairbanks school district are all zoned to Riata Ranch. Don’t forget the Lone Star Community College, Cy-Fair branch just down Barker Cypress. Amenities around Riata Ranch include a new dining and shopping destination called Boardwalk at Towne Lake. Other destinations include Houston Premium Outlet Mall, Langham Creek YMCA, Goodie Company BBQ, LA Fitness and Darren Goforth Harris County Park that includes a dog park. To schedule a tour of Riata Ranch homes for sale or to receive price information on your home, please contact Mark McNitt at 832-567-4357.